This popular 18k yellow gold twisty ring has a beautiful floral engraving and 14 round diamonds that range from .04 to .025 carats. You choose your center diamond from our inventory. 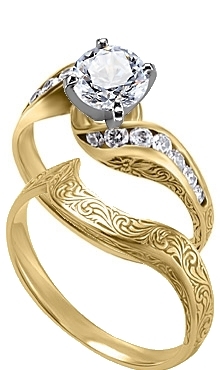 The engraved twisty band fits snuggly against the ring for an exquisite matched set. Total carat weight of set is .50.